At Kingston 11, find a friendly island vibe and plenty of slow-cooked Jamaican goodness. Chris Duffey Compared to other jerk chicken dishes, Kingston 11's version is smoked. Hours: Tue.-Fri. 11 a.m.-3 p.m., 4-11 p.m.; Sat. 5-11 p.m.; Sun. 11 a.m.-4 p.m. The first thing you notice at Kingston 11, a Jamaican restaurant in Uptown Oakland, is how friendly everyone is. The server goes out of her way to compliment the toddler at your table; the guy who busses your table takes a moment to ask how everything tasted. Even on a busy night, there's a good chance that co-owner Adrian Henderson, who runs the front of the house, will stop by your table and thank you personally for coming out. "One Love" is painted in bold black letters on the side of the building — a reference to the Bob Marley song, of course, and also to the restaurant's overall sensibility. This is a place where everyone is made to feel welcome. If that isn't enough to make you want to go, there's also this: The food, much of it lovingly slow-cooked over the course of many hours, is some of the most memorable I've had this year. Having run Kingston 11 as a twice-a-week pop-up for about three years, Henderson and fellow co-owner (and chef) Nigel Jones finally opened a place of their own this past November. In doing so, they set about the task of putting Jamaica on the map, quite literally: A mural of the Jamaican flag covers the entire side of the building (right next to the "One Love," so that from the right vantage point you can identify the restaurant from across the city — a rare case where "X" (the flag's distinctive gold cross, set against black and green) really does mark the spot. What's truly notable, however, is the way in which the restaurant brings traditional Jamaican flavors and cooking techniques to the Bay Area. A native of Kingston, Jamaica, Jones, like all good practitioners of home-style Jamaican cookery, understands that, often, the most important ingredient is time. 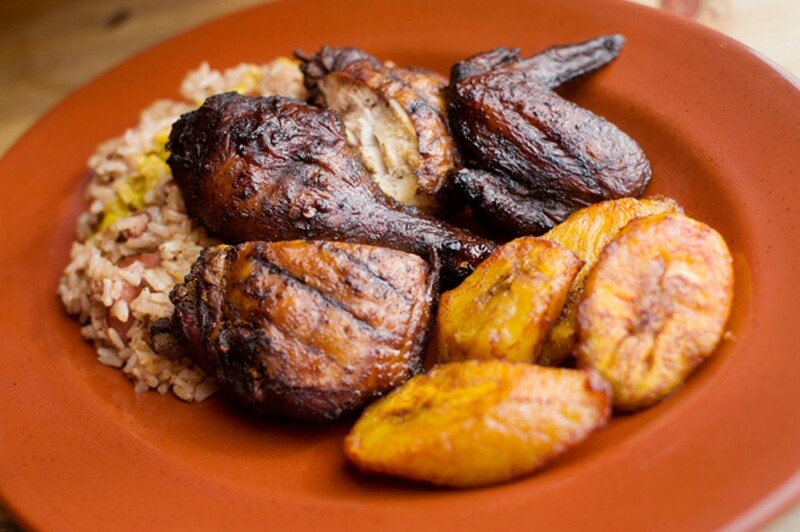 Take the restaurant's signature dish, the jerk chicken. At Kingston 11, that chicken gets a full 48 hours of flavor infusion — a dry rub (allspice, garlic, and fresh herbs) followed by a long soak in a lime-and-Scotch-Bonnet-pepper marinade. The meat gets cooked low and slow, first in the convection oven and then in the smoker, so that the end result had the succulence and the deep smoky flavor I associate with competition-grade barbecue, as well as a deep, penetrating heat that cleared my sinuses straightaway. (The smokiness was a revelation: Too often in this country, "jerk" refers only to a sauce or seasoning blend; in Jamaica, jerk is always smoked.) The dish came with a mound of coconut-milk-infused Jamaican rice and peas (kidney beans, or "red peas" as they call them in Jamaica) — a satisfying side. At just $14, this was a steal. The oxtail stew was yet another dish where long seasoning and cooking times made all the difference. Served on the bone, the meat had been cooked so long, and was so tender, that even a fork was scarcely needed: I'd just put the whole bone in my mouth, sucking the meat and the soft cartilage right off. The braising liquid was addictively savory, with just a hint of sweetness — from pomegranate molasses, Jones later told me — and big, starchy butter beans were a flavorful addition. But perhaps my favorite dish of all was the curried goat, available only Thursday through Saturday: lush chunks of goat, just fatty enough, and little marrow-filled bone segments whose meat had fallen clean off. The goat was perhaps the most tender I've had, and the soupiness, and the low, slow-building burn, of the coconut-milk-based curry sauce were fantastic. With either of the braised dishes, you can pay $2 for a rice-and-peas upgrade, but for my tastes, the plain jasmine rice that comes standard is best for soaking up all of the saucy goodness. Among the entrées I tried, only the Spanish Town Roasted Chicken was somewhat pedestrian. The meat was tender and well-browned, but it was basically just plain roast chicken — a dish meant to appeal to the spice-averse: tasty enough, thanks to the inclusion of sweet whole roasted garlic cloves, but not nearly as exciting as some of the other dishes. 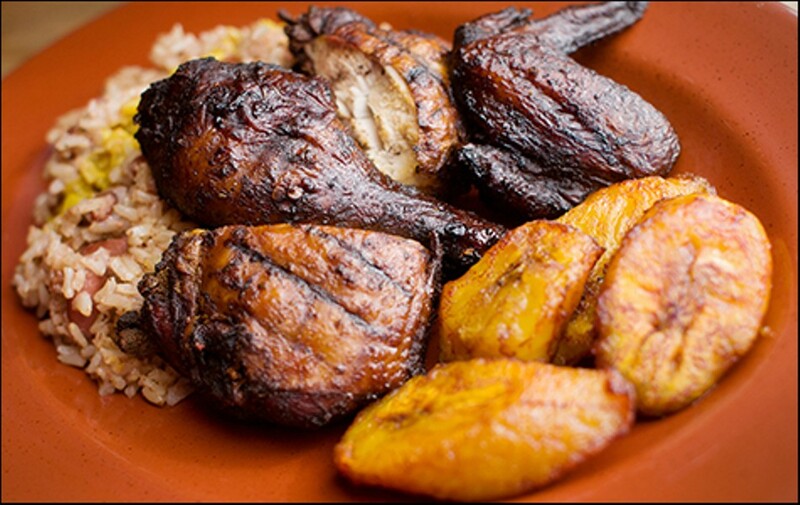 All the entrées come with rice and fried plantains, so be wary of carb overload when selecting additional appetizers and sides. Among these, the saltfish fritters had an enjoyably crisp panko breading and came with a bright, silky chimichurri sauce, though I found the fritters themselves consisted of too much mashed potato for my liking. My favorite side was a simple plate of squeaky-crisp sautéed string beans, tossed in a vaguely Asian-tasting chili sauce. Part of the restaurant is dominated by a bar, which the owners have dubbed Fern Gully, after a famous scenic area in Jamaica, and there's an extensive selection of craft cocktails. But the house-made non-alcoholic beverages were too tempting to pass up: the no-joke, burn-your-throat ginger beer and the sorrel, a kind of hibiscus-based punch, which itself had a distinct gingery kick. Look elsewhere if you need to relieve the heat: While the sweet, fruity rum punch wasn't the most memorable libation, it proved to be an effective cooling salve to wash down the spicier dishes. As good as the food is at Kingston 11, the vibe is equally enjoyable. If you come early on a weeknight (happy hour starts at 3:30), the sun-soaked dining room feels easy and laid-back. If you come on a Thursday or Friday night (when live music and a DJ are scheduled, respectively), the bass will be thumping and quiet conversation will be a near impossibility — but what kind of sourpuss feels grouchy at a reggae party? At a certain point, it starts to feel like a cliché to talk about the diversity of Oakland's dining scene and how much more "real" its restaurants are compared to those in other cities. But at Kingston 11, where people of color make up the majority of both the staff and the customers, and the crowd is a reasonable facsimile of Oakland itself, the point rings true. "The communities of different cultures have embraced us," Jones said. "And we embrace them back."